With so many dog foods on the market, it can be hard to decide which one is right for your beloved Vizsla. Your Vizsla is more than just a pet. He’s a cherished part of your family who you want to treat as such. Vizslas need a high-quality diet to keep them healthy. This energetic breed needs a good diet of protein-rich food to keep them going. A Vizsla is a strong, energetic and affectionate breed of dog. These athletic dogs make great additions to active families. If you’re looking for a running partner, this is the breed for you. Vizslas require a good amount of exercise to get out their energy. They make great partners for runners, hikers, and bikers. Vizslas are also great hunting dogs. Vizslas will do well with families with children. They like to stay busy and don’t like being left alone. You should expect to give at least 30-minutes of exercise to your Vizsla a day. They love to run on and off their leash. They’ll do well with games of fetch and regular mental stimulation and training. Male Vizslas typically weight 44-64 pounds and are 22-25 inches tall. Female Vizslas weigh 40-55 pounds and are 21-24 inches tall. A Vizslas lifespan will be between 11 and 14 years. High-quality food will help your Vizsla live a long and healthy life. Proper nutrients will help with digestion, energy, coat health, and longevity. Dog foods made with artificial fillers and ingredients won’t add any nutritional value and they can often do more harm than good. Vizslas are generally a healthy, active breed that can have lifespans of up to 14 years. There are some common health issues within the breed to be aware of. Epilepsy is the common cause of seizures in some dogs. Dogs who suffer from seizures can have them randomly, every couple of years or several times a year. There are treatments and medication that can help your dog live a normal life between seizures. With the proper medication, even dogs with severe epilepsy can continue to live as normal and not have any change in life expectancy. Many times, after sporadic seizures, dogs can recover almost immediately and go back to normal. These dogs can often do so without any medication at all. When a vein or artery is blocked, and blood can’t flow through the blood vessel this is known as a blood clot or thrombus. Like in people, dogs can have blood clots in their heart or arteries. A dog with blood clot disorders will have a disease that causes blood not to clot properly. A sign of a blood clot can be difficulty breathing, coughing up blood or blood in a dog’s urine. If it’s determined your dog has a blood clot disorder, they will be given a prescription medication that will help the clots from forming. In most dogs, Hypothyroidism is caused by the immune system. The immune system reacts to the thyroid as a foreign object and will begin attacking it. A dog with hypothyroidism will suffer from weight gain, thinning hair and hair loss, lethargy, a slower heart rate, and high cholesterol. They will often be lethargic and have a decrease in appetite despite their weight gain. A blood screening can be done if you suspect your dog is having issues. Since it’s a common health problem among Vizslas, breeders are required to run this test before breeding a dog and their results must be made public. Your dog must be given medication for life to treat this condition. Although there is no cure, through medication, your dog can continue to live a healthy life. There are several key ingredients to look for in high-quality dog food. You should always want to see quality protein, natural fibers, vegetables and fruit listed among the top ingredients in your dog food. Oils and minerals for heart and coat health, probiotics for digestion and whole grains are also key ingredients to look for. Food made from all-natural ingredients is always going to be your best bet. 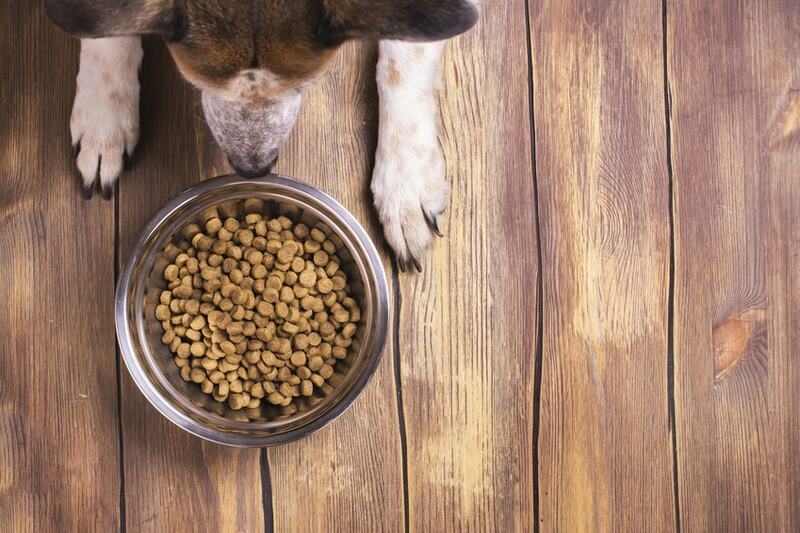 Don’t be alarmed if you see meat meal listed as one of the ingredients in your dog’s food. Meat meal is actually a great source of protein. During the cooking process, the protein such as beef, for example, is cooked by removing all of the moisture. This will increase the protein concentration making it a great source of protein for your pup. When reading a dog food label, note that the first five ingredients are usually the most important. Ingredients go in order of quantity as well, so the ingredient listed first has the most quantity. Although there are hundreds of dog foods on the market. It can be a difficult decision choosing which one is best. When reading food labels, there are a few ingredients you should always try and avoid. Artificial preservatives and artificial flavors add no nutritional value and are just fillers. Too many starches and fibers can also be harmful to your pet. You’ll often see large amounts of potatoes in a grain-free food. Dogs without grain allergies or intolerances don’t necessarily need to be fed a grain-free diet. It can actually be just as harmful when they are fed too much starch to replace grains. The FDA has made some correlations between certain diets and heart disease. Read more about their findings on fda.gov. If you suspect your dog does have a food allergy or food intolerance, however, talk to your vet. They’ll often suggest an elimination diet to rule out which foods your dog is sensitive to. Chicken, grain, dairy, and eggs are often the most common food allergens. Ingredients to avoid include, meat by-products, corn, large quantities of grain, and preservatives. These are all low-cost fillers used to keep costs down and replace more expensive meat proteins. Brands that use large amounts of these ingredients are Purina Beneful, Kibbles ‘n Bits, Iams, Purina Dog Chow, Muenster Natural, Ol’Roy from Walmart, and Pedigree. The Daily Dog Stuff goes into great detail about the ingredients used in these foods and why they are so harmful. Vizslas often have sensitive stomachs. Some of the worst foods for them include foods with common allergy triggers such as eggs, dairy, wheat, and chicken. While not all Vizslas have food intolerances, keep on the lookout for excessive paw licking, itching, and hair loss if you suspect your pooch is allergic to something. Artificial fillers and preservatives can also be harsh on your dog’s stomach. Avoid these ingredients when shopping for food for your Vizsla. Typically, an adult Vizsla will eat around four cups of dry dog food daily. Vizslas have a healthy appetite and will usually eat well when they are young and active. Be sure to adjust your Vizslas food as they age. A Vizsla puppy may still eat four cups a day but they will often need to eat more frequently. Their stomachs are smaller and a smaller more frequent meal will help disperse their energy and help with digestion. You should keep feeding your Vizsla puppy food until they are fully grown. For a Vizsla, this is around 12 months. From that point, you can start to introduce adult food and decrease the frequency of their meals to two times a day. An aging Vizsla may drop down to two cups of dry food a day as they get into their senior years. They may also start to only eat once a day as they get older. Vizslas are an energetic and athletic breed so don’t be surprised if they don’t show signs of slowing down until they reach double digits. Always have plenty of fresh water available to your dog and watch out for too many treats and human table food. These can cause obesity and other health problems. Since Vizslas do well with training and positive reinforcement just keep their treats smaller and all natural. They are still great motivation for their active minds. Your smart, athletic Vizsla will need high-quality food to keep them sharp and active. They have a lot of energy and a lot of love to give. These loyal companions and workout partners will love joining you outdoors, playing games, hunting, running and walking. The foods discussed below are great options to help them keep doing those activities with you for many years to come. Instinct by Nature’s Variety Limited Ingredient comes in a few different protein recipes. These recipes are all made with a single protein and limited ingredients so there aren’t any artificial flavors or harmful fillers. There is only one protein added to each and one vegetable. This recipe is great for dogs with allergies or food sensitivities. Grass-fed lamb is the first ingredient in their lamb recipe. Lamb is easy to digest and a great source of protein and amino acids. No eggs, potatoes, wheat, artificial preservatives, dairy or soy is added to this recipe. NomNomNow makes fresh, human-grade dog food that is delivered to your front door. Their recipes are designed with your specific pet in mind and they can be ordered individually or on a regular schedule. The food comes perfectly portioned for your pooch and it can be stored in your freezer or refrigerator until 24 hours before you’re ready to serve it. You begin by setting up an online profile describing your dog’s size, age, weight, breed, and any allergies or restrictions. NomNomNow will then recommend recipes and portion size for you. You can receive regular deliveries of food so you’ll always have some on hand and not have to run to a store last minute. Their recipes are all made with fresh, human-grade ingredients so you know exactly what is in your pet’s food. American Journey is great for adventurous pups. Their grain-free recipe features salmon and sweet potato, and amino acids for their muscles. Kelp, carrots, and fruit such as blueberries, round out this nutritious recipe. There are good fibers, omega fatty acids, and antioxidants. There are no artificial preservatives such as soy, corn or wheat. This food is perfect for pups with grain allergies or sensitivities to certain foods. Puppy Vizslas need a lot of high-quality fuel to keep them going. Energetic Vizsla puppies will have a hearty appetite. They’ll need to be fed a few times a day. You’ll want to wait to give them adult food until they are at least 12 months old. Here are a few great food options for your precious pup. The large breed wet puppy food from Nutro is a great choice for your growing Vizsla. The all-natural food is made for large breeds. This recipe features lamb, fish oil, vitamins, rice, sunflower oil, and plenty of minerals to fuel your active Vizsla puppy. This holistic food uses fresh ingredients including bison, calcium and a variety of superfoods. They use a holistic method of sourcing ingredients and cooking to help your pup feel their best. This dry kibble is designed for medium and large dogs. There is real bison included as well as carrots, pumpkin, almond oil, cranberries, and lentils. No artificial flavors, wheat, soy or corn are used in this recipe. These are all allergen triggers that can be harmful to Vizslas with food allergies. Senior dogs require a special diet to help them through their golden years. When a dog ages, they tend to require fewer calories. Older dogs become less active and won’t need as much food as they once did. Vizslas are very active dogs. Don’t expect them to slow down too much before they reach 10 years old. You should switch to a senior food around this time to help them get the extra nutrients they need. A diet that is lower in calories and high in calcium is important for their joint and bone health and weight management. Here are a few of the best foods for your senior Vizsla. Instinct by Nature’s Variety is a great option for your senior Vizsla. This recipe features a high-protein kibble mixed with freeze-dried raw pieces. The raw pieces are real chicken that has been freeze-dried and naturally processed to hold a high concentration of protein. There is also DHA to support eye and brain health. The raw nutrients come from the freeze-dried chicken giving your senior al all the benefits of raw meat. L-Carnitine is added to help with weight management and your dog’s metabolism. To keep their bones and joints healthy, natural glucosamine is included. This recipe is made with chicken meal, tapioca, peas, chickpeas, and real chicken.